Norfolk is full of holes, little dells and corners, drives and pathways that sort of amble off in all directions vanishing over a rise or fading into a dark arch of trees. East Somerton is just one of those many little nooks that almost don’t exist, the past clinging on to the now, solid blocks sticking through the temporal landscape slowly being reclaimed by nature’s advances. It also has the advantage for those who like these shady corners being quite difficult to see. Simon Knott on his first visit commented that he didn’t spot it despite being parked right next to it, on our first visit at the end of a particularly verdant time of spring growth hid it in a wall of green, ivy masking the walls in the trees. 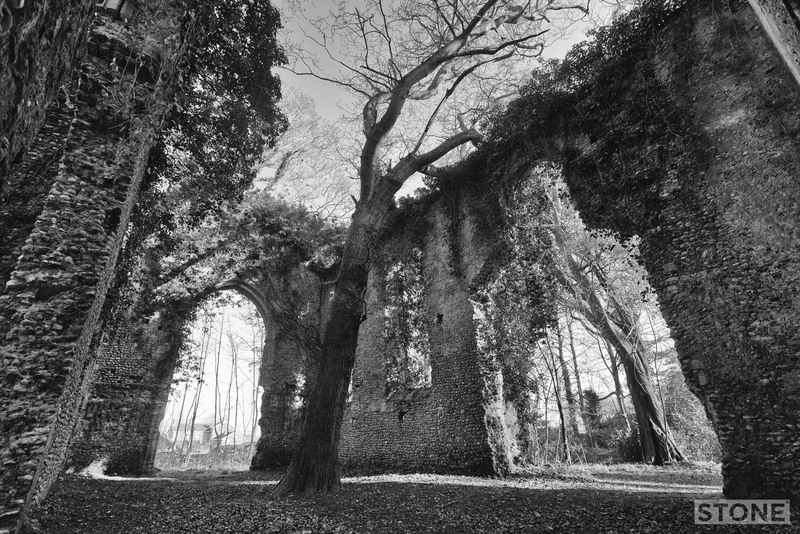 Simon covers what the ruins are pretty well on his website, there’s relatively little point in me transcribing it into my own words so I suggest a visit to him for the church crawler view of it. I’ll just say it’s fifteenth century, perpendicular in style and had very high windows, most of the Ashlar dressing has long since been robbed out and away as has the entire chancel leaving three huge holes; cave entrance-like doorways points that give the internal enclosure a strange almost magickal feel. The materials won’t be far away, hidden in farm walls, maybe in other churches or Burnley Manor itself. 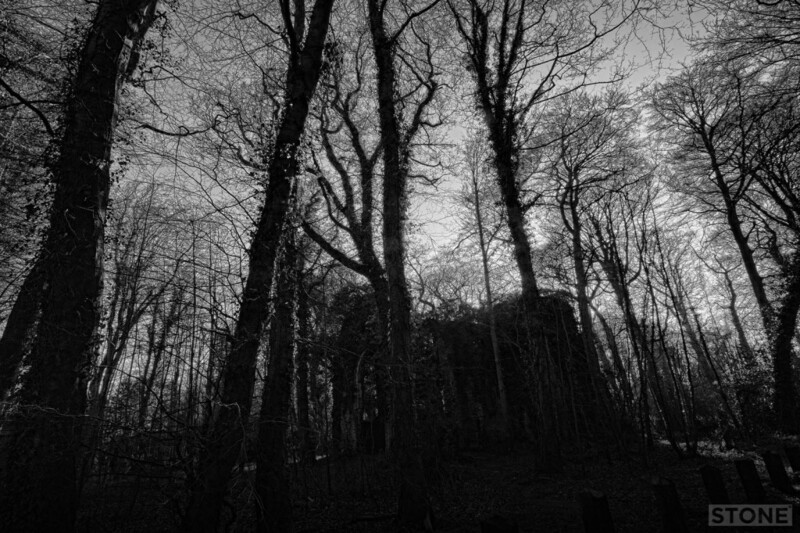 There’s also a tale of witchcraft and burial here that relates to the tree in the middle of the church, sometimes called the witch’s finger or witch’s leg. It smacks of local folktales and relates to a story of an old woman, or witch, with a wooden leg was buried in the nave and the tree sprouted from her. Whether there’s any facts involved in this is open to question, I can only find hearsay in various dubious corners of the internet; mostly people hiding behind a username insisting it happened but not corroborating it with any record at all as is expected generally in these circumstances. Like most ruins it feels spooky and you end up wondering which came first the ruin, or the story. In cold winter light anything seems possible, however improbable it actually is, or whether there is any basis of fact, but then we live in a world of fakery now, and in fact always have enjoyed that chill of the improbable being true. It would doubtless be a good place for a survey or dig of some kind. It has been out of use as anything much more than a chapel for three hundred years, West Somerton church taking over duties in the late seventeenth century. Blomfield reported it out of use for many years in 1810. before which it seems to have passed through many hands as part of the manor back to the Norman Conquest, De Noire, De Albini, de Somerton and Robert Falstaff all get a mention as it is passed around. I’d hesitate at directly calling this a Deserted Medieval Village in the full sense, it seems to be shrunken, and subsumed by a manor and still has houses on the road opposite. But it’s certainly an interesting spot, nestling as it does in the trees not far from the flat lands where the discomfortingly named but somehow apposite vill of Winterton sits, also a place where lots of history sits near the surface, visible and unseen. …seek and you will find. This is for Sarah, who got me into all this bloody old church nonsense in 1982 or thereabouts.